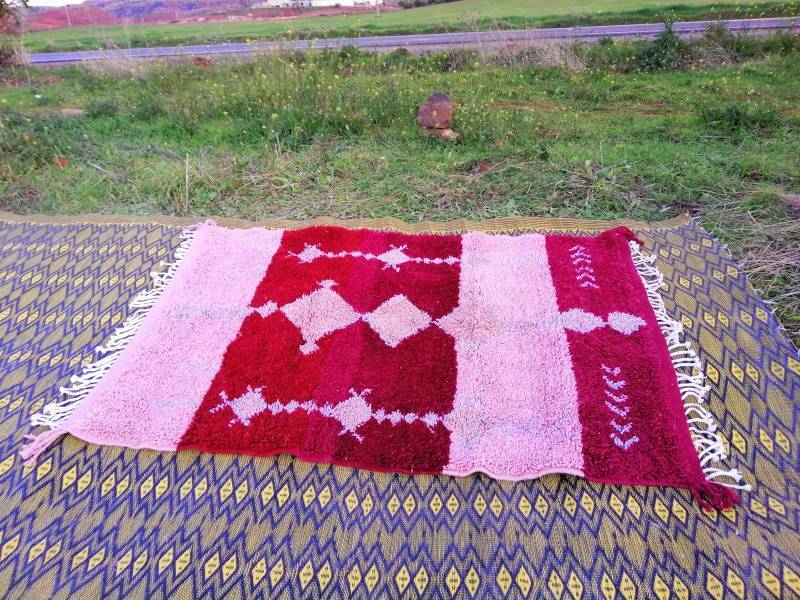 This rug varies from one region to another according to color, decoration and production method. 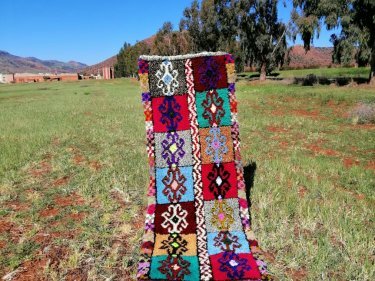 Made of natural wool this rug is quite versatile, in the winter the pile side is placed up to keep things warmer and in the summer the pile side is placed face down to keep things cooler. Each knot is individually tied by hand making it a true feat of craftsmanship. 4247Dh: This price includes shipping within Morocco. To order, e-mail us at hello@theanou.com and we will help you with payment options. 4247Dh: Le prix inclut la livraison au Maroc. Pour passer commande envoyez nous un message à l'adresse hello@theanou.com et nous vous présenterons les différentes options de paiement. Want to visit Cooperative Tiglmamin in person? The cost is $10 USD per person, all of which is donated to the cooperative. Visits include tea, snacks and work demonstrations! Fill out the form below and we'll send you additional details and payment options when artisans confirm your time. Rachiha was born in 1988 in Khenifra, she has two brothers and one sister. She has the equivalent of an ... show more Rachiha was born in 1988 in Khenifra, she has two brothers and one sister. She has the equivalent of an eleventh grade education. When she decided to stop her studies she pursued her creative endeavors via jewelry making. She started her work with the Women's Cooperative of Khenifra in 2008, making handmade jellaba button jewelry. 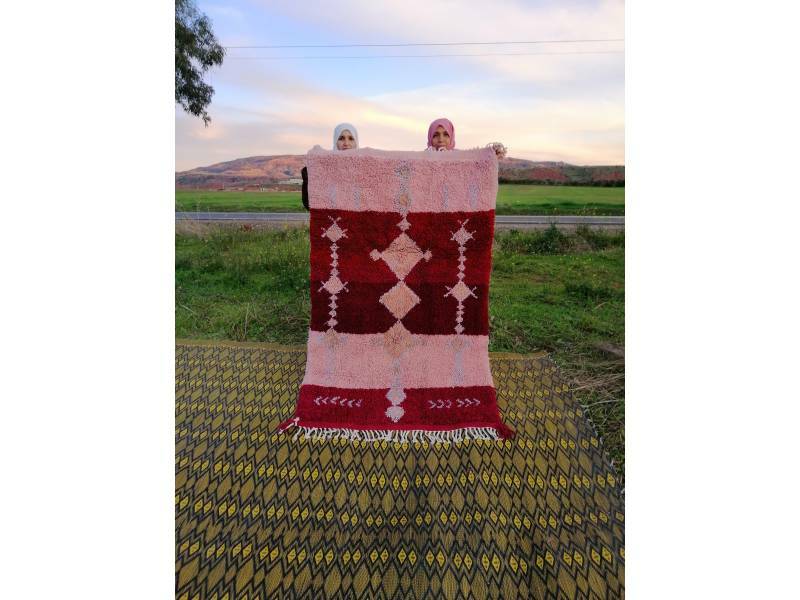 In Rachida’s words, her work as an artisan has opened up doors to the world. Rachida has worked closely with various Peace Corps Volunteers through the years and has had the opportunity to travel twice to the United States to participate in international arts festivals. 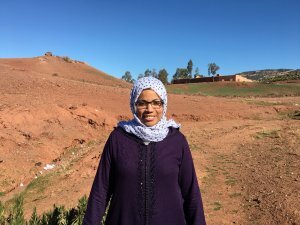 Rachida started working as an Anou artisan leader in August of 2017 and during her time with Anou the seeds for Cooperative Tiglmamin were planted. Rachida is the current president of the cooperative and the beating heart of this family group. Rachida hopes to increase the opportunities not only for herself but for her cooperative through weaving. She would like to share the products and traditions from their region with people around the world. 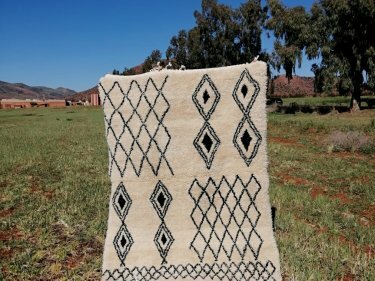 This product features 100% natural wool sheered from local sheep. 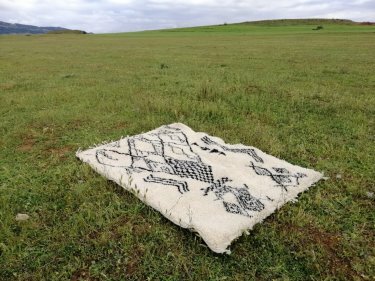 show more This product features 100% natural wool sheered from local sheep. 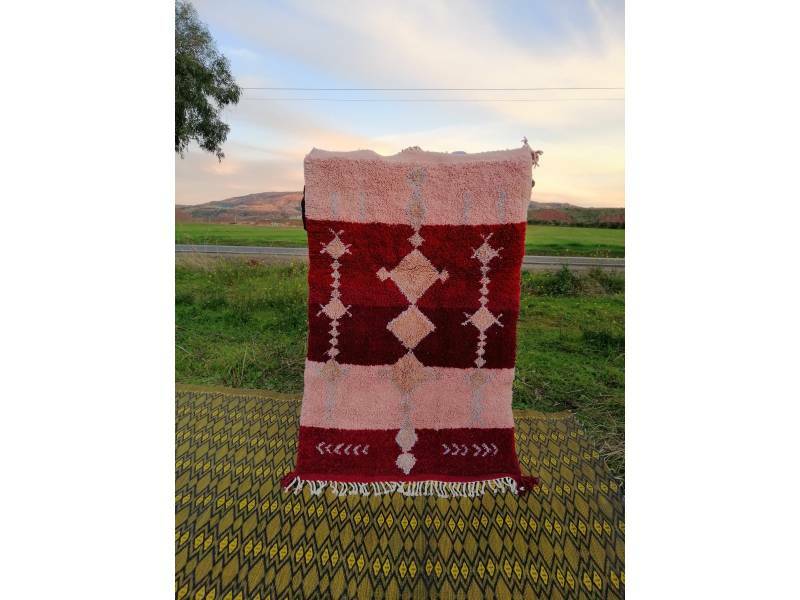 This product features natural wool hand dyed in house using environmental and people friendly processes. show more This product features natural wool hand dyed in house using environmental and people friendly processes. 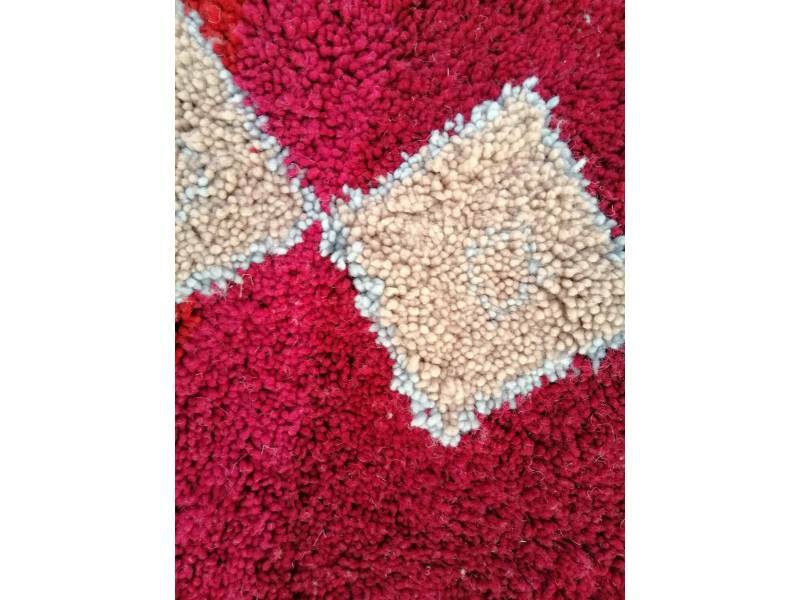 The taska is used after every new row is added to a carpet. It helps ... show more The taska is used after every new row is added to a carpet. It helps to compress the weave and keep everything in alignment. This hand-picker, known locally as “Imachdan” is used to separate the locks of wool and ... show more This hand-picker, known locally as “Imachdan” is used to separate the locks of wool and prepare it for carding, combing and spinning. Known locally as “Ikarchal” this set of wooden paddles studded with very thin nails is ... show more Known locally as “Ikarchal” this set of wooden paddles studded with very thin nails is used to take the partially combed wool and create fine sheets of wool used to create wool string. Known locally as, “lmaghzal” this tool is used to spin wool thread to ensure a ... show more Known locally as, “lmaghzal” this tool is used to spin wool thread to ensure a high quality finish. 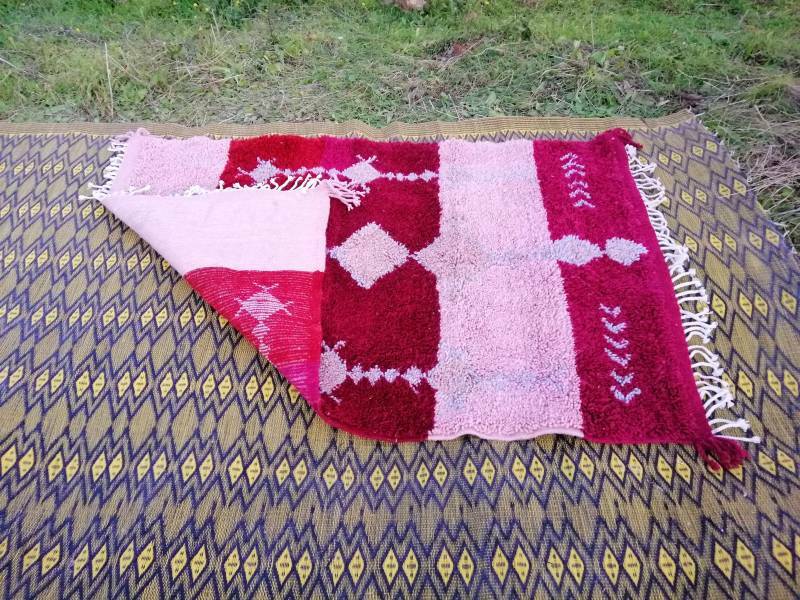 This rug is woven on a traditional wooden loom that is shared by the women ... show more This rug is woven on a traditional wooden loom that is shared by the women of the cooperative.